Gondola Base can be used with 24 in. grid or slatgrid panels for constructing the perfect display. Available in White, Chrome or Black. 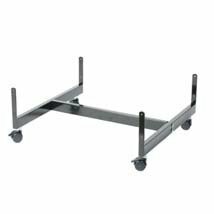 The Gondola base comes with four casters for easy mobility. The Gondola is 24 in w x 24 in d and height depends on which panel is used.